Vanity Fair contributing editor and former New York Times reporter Howard Blum has written a scintillating nonfiction spy thriller about the efforts of an Army cryptanalyst and a veteran FBI agent to uncover and bring to justice the Soviet agents who infiltrated the Manhattan Project to steal atomic bomb secrets for Stalin. 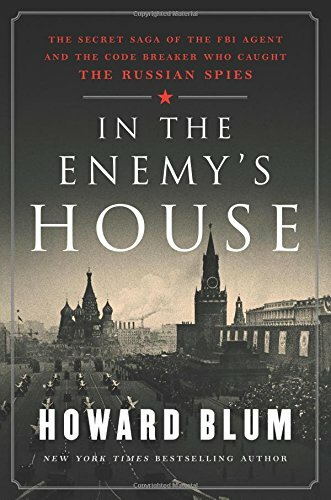 Blum describes his new book, In the Enemy’s House, as “the story of one of the nation’s great, but barely known, intelligence triumphs,” known by its codename Venona. Since their release in the mid-1990s, scholars have methodically sifted through the Venona intercepts—decoded and translated diplomatic cables between Moscow and its Soviet spy handlers in the United States during World War II and its immediate aftermath. Meredith Gardner, one of the book’s two main protagonists, is described by Blum as an introvert, a thinker who “took refuge in ideas.” Beginning in late 1942, he worked as a cryptanalyst at Arlington Hall, using his particular genius to break Soviet codes. The book’s other main protagonist is Robert Lamphere, a veteran FBI agent who was assigned to the bureau’s Soviet Espionage squad. Lamphere was Gardner’s opposite—an extrovert, hard charging, temperamental. Their personal efforts, and those of the agencies they worked for complemented each other. Gardner and other cryptanalysts deciphered secret messages. Lamphere and other FBI agents debriefed defectors, conducted surveillances, tracked down leads, and interviewed suspects. Cooperation between intelligence and law enforcement led to the breakup of the Soviet atomic spy ring and the prosecution of several key members of the conspiracy. Blum identifies an anonymous letter to the FBI in August 1943 and the defections in September–October 1945 of Igor Gouzenko and Elizabeth Bentley as the first hints that Soviet spy networks were operating in the U.S. But, unmentioned by Blum, as early as 1939, Whittaker Chambers had revealed to the Roosevelt administration that cells of Soviet agents were operating throughout the government. FDR refused to believe it. Enormoz succeeded for three reasons: the ideological attraction of communism; the Roosevelt administration’s portrayal of the Soviet Union as America’s heroic wartime ally against the Axis powers; and the carelessness with which FDR dealt with allegations of Soviet infiltration of the U.S. government. Gardner and Lamphere began working together in October 1948. One by one they pieced together the puzzle of Soviet cables, identifying codenames for Soviet agents and the respective roles the agents played in the spy ring. The first key agent identified was Klaus Fuchs (codenamed “Rest”), a British scientist who worked on the Manhattan Project. In late January 1950, Fuchs confessed his involvement in the spy ring. He was arrested by British authorities in early February. Fuchs identified his American contact as “Raymond.” Agent Lamphere interrogated Fuchs and tentatively identified “Raymond” as Harry Gold. Later, under questioning by other FBI agents, Gold admitted that he was Fuchs’ American contact. The dominoes, Blum writes, were beginning to fall. Gold cooperated and described another Soviet agent he dealt with at Los Alamos. Meredith Gardner deciphered additional cables that pointed to Gold’s agent codenamed “Kalibre,” who was later identified as David Greenglass. Greenglass was subsequently contacted by the FBI and confessed. Greenglass identified his recruiter to the spy ring as Julius Rosenberg (codenamed “Liberal” in the Venona intercepts), his brother-in-law. Blum notes that Greenglass “portrayed Rosenberg as the lynchpin in a network of Soviet spies.” Ruth Greenglass, David’s wife, implicated Julius Rosenberg’s wife Ethel in the conspiracy, and Venona cables confirmed it. Julius and Ethel Rosenberg were both given the opportunity to cooperate, but they refused. They were subsequently charged with conspiracy, convicted at trial (without Venona evidence, which was judged too secret and valuable to reveal), sentenced to death, and executed in the electric chair. “Your no. 5356 [a]. Information on LIBERAL’s [ii] wife [iii]. Surname that of her husband, first name ETHEL, 29 years old. Married five years. Finished secondary school. A FELLOWCOUNTRYMAN [ZEMLYaK] [iv] since 1938. Sufficiently well developed politically. Knows about her husband’s work and the role of METR [v] and NIL [vi]. In view of delicate health does not work. Is characterized positively and as a devoted person”. Moreover, KGB files released by Russian defector Alexander Vassiliev confirmed Ethel’s role in the espionage conspiracy headed up by her husband. Under the law, each member of a criminal conspiracy is responsible for the foreseeable actions of his or her co-conspirators. Finally, Blum downplays the fact that Ethel and Julius Rosenberg could have avoided the electric chair if they confessed and cooperated with the FBI and federal prosecutors. They refused to do so and thereby effectively gave their lives for Stalin’s Soviet Union. Blum’s sentiments here are misplaced.